Book a trunk show & talk together with a workshop for a discount! 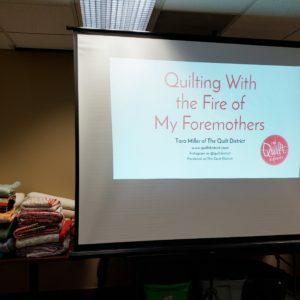 This one-hour lecture and trunk show examines and celebrates the quilting legacy we carry from our foremothers (whether your immediate foremothers were quilters or not). I’ll share my journey and my passion for the relationship between what’s old and what’s new how the old and new exist on a continuum rather than in a vacuum exclusive of one another. Throughout generations, quilt making provided women with platforms for their artistic and political voices, as well as their expressions of love and necessities of utility. We’ll talk about women’s lives, women’s voices, and we will rejoice in our legacies. With a vintage quilt as our inspiration, we’ll make a diamonds quilt using strips! 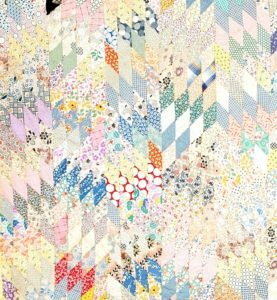 This workshop is geared toward the confident beginner or intermediate quilter and illustrates just how relevant vintage quilts are today! Students use strips from their stash or a jelly roll. Make a little or a lot!